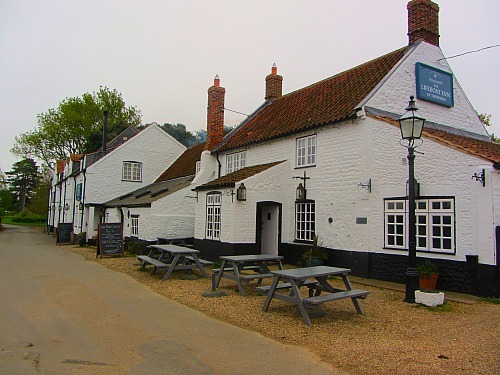 The Lifeboat Inn, Thornham, is a wonderful 16th Century Smugglers Inn, and in some of the rooms it doesn't take much imagination to think how it must have been used for that very purpose all those years ago. This histroric pub is a fantastic place to come and stay, where you can totally unwind and relax and enjoy the peaceful surrounds. 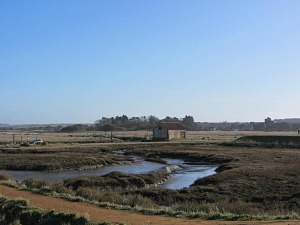 Being set on a quiet and secluded lane, there is no noise from the traffic and it’s only a stone’s throw away from Thornham Harbour and the Norfolk Coast Path where you can marvel at the coastline, take long walks or venture onto the lesser known and undisturbed beach of Thornham. It’s also extremely dog friendly and has excellent food and drink! Walk inside to the reception desk and straight away you’ll see through to the lobby area with its huge fireplace and original painted flintstone walls and oak doors and oak staircase. Everything about this part of the building is unusual for most of North Norfolk. It’s totally original. On a cold winter’s day, maybe after a trip to one of the nature reserves nearby, come back and warm yourself on the fender surrounding this fire, or just sit in one of the comfortable leather chairs in the lobby. 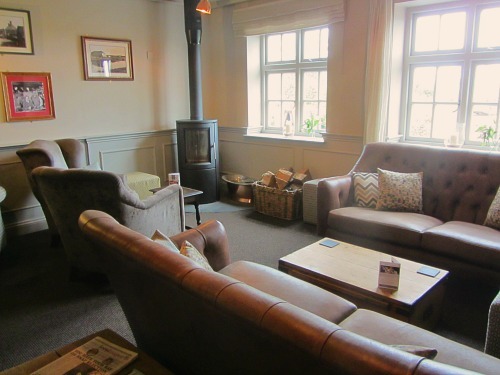 If you want somewhere a little quieter, walk through to the large open lounge which retains its heat beautifully, and sit by the log burner in a comfy armchair and mull over your day’s walk, or bird watching with a drink in hand! There is also ample car parking here. 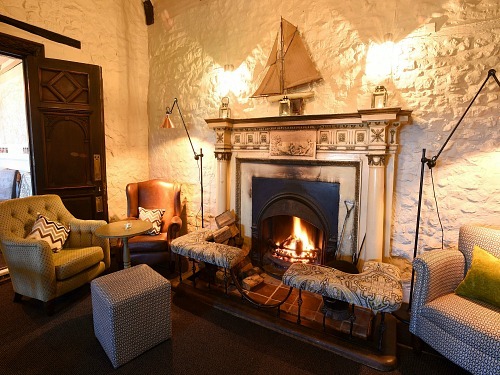 You can find out more about the rates and the rooms at The Lifeboat Inn here. It oozes character. There is nothing commercial around The Lifeboat Inn at all, which is what you might love about this particular Inn. So once past the reception desk and into the lobby you’re confronted with this fantastic huge fireplace. And the large oak doors to your left lead into the restaurant or a more casual lounge area, and to your right you can wander into the wonderfully oak carved bar area with wood turned pillars. With its wooden carved banisters, this pub has retained many of its original features and really makes for a unique place to stay. Bursting with character. It has a wonderful rustic charm about it. 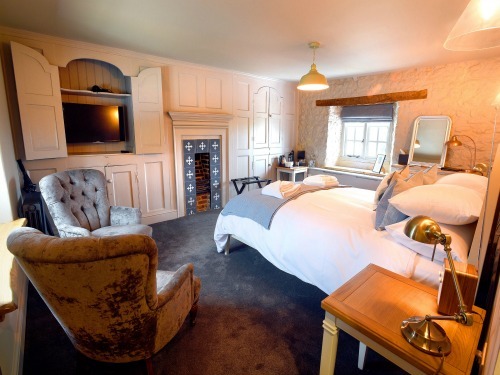 By complete contrast, the sister pub, The Chequers Inn, is just along the road in Thornham and is a completely refurbished pub with restaurant and rooms but in a totally different style. Both of these establishments treat your four legged friends in exactly the same way as well – very welcoming and they're never too much trouble! You can read more about The Chequers Inn here. 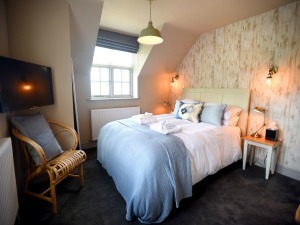 This wonderful pub has one advantage over many of its rivals; it is right on the marshes and because of this fantastic location, many of the rooms have the most beautiful view looking straight out onto the Thornham marshes and beach. These marsh views are some of the best views in Norfolk, in my opinion. Dogs are very welcome. In fact when I was visiting I think I saw at least 3 dogs either going up the stairs, or coming down the stairs and going off for a walk along the marshes. 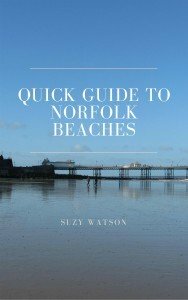 The pub is about 10 minutes walk from the beach or just a few minutes’ walk away from the Norfolk Coast Path. 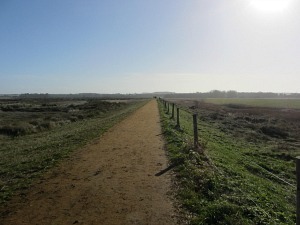 This particular stretch of the Norfolk Coast Path heading west is a wonderful walk through the marshes and on towards Holme Dunes Nature Reserve. As with most eating establishments, there are a few restrictions on where your dogs are allowed once in the pub. For the Lifeboat Inn, the dogs aren’t allowed in the restaurant, but there are many other options where you can eat and have your pet with you for every meal. Staying here, your dog, or dogs, will be treated to a sausage in the morning for breakfast! They are also given a welcome pack with their own personal letter as well as a dog bowl and blanket. You can’t get more dog friendly than that! Rest assured, this is a very dog friendly pub. And if you don’t have a dog, well that really doesn’t matter either; you’ll still be very welcome indeed! There are 13 luxurious dog friendly rooms. 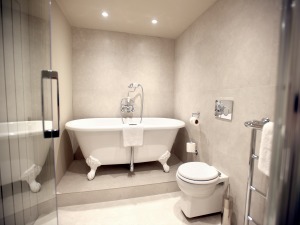 All the rooms have recently been refurbished and are beautifully done up with attention to detail; substantial heavy doors, fabulous bathrooms with showers, digital radio, wifi and TV, comfortable beds and puffy pillows and so on. The pub retains many of its original features. It has real character. All the rooms are very different too, no one room is the same. 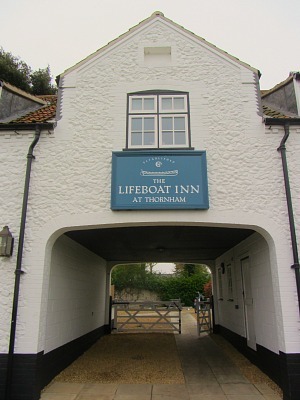 And as it’s The Lifeboat Inn, all the rooms are named after the original lifeboat crew in Hunstanton, a nice local touch. 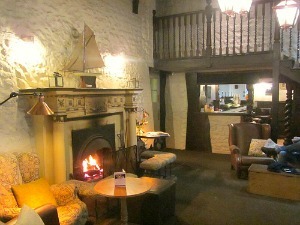 The Lifeboat has a choice of a few rooms where you can eat and drink. 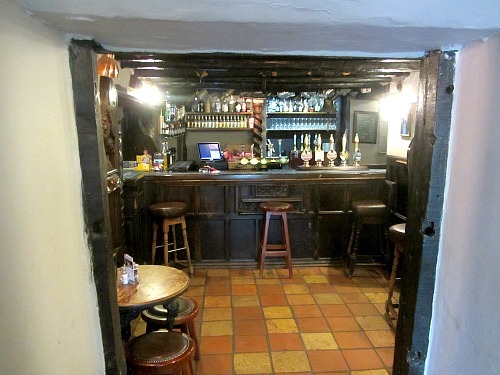 For a drink, there is a fabulous old fashioned oak carved bar with traditional surroundings, very in keeping with a Smuggler’s Inn and serving draft beers. 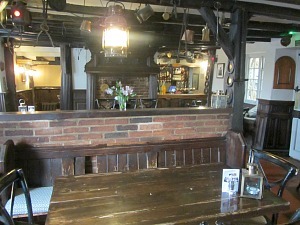 Then there is the stone flagged bar area which again is dog friendly, and has wooden benches, chairs and tables. This is an oak beamed and oak panelled room and very cosy with a fire going in the winter months. 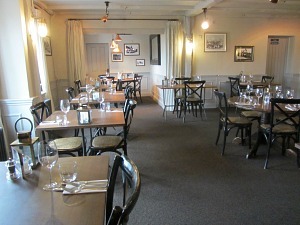 You could also choose the restaurant (not dog friendly) which is a little bit more formal compared to the bar area. Or finally, you could choose the conservatory, a really lovely light area with a 200 year old vine climbing along the inside of the roof, and even produces grapes, although I don’t think enough to make their own wine (!). This is also where you can have breakfast. 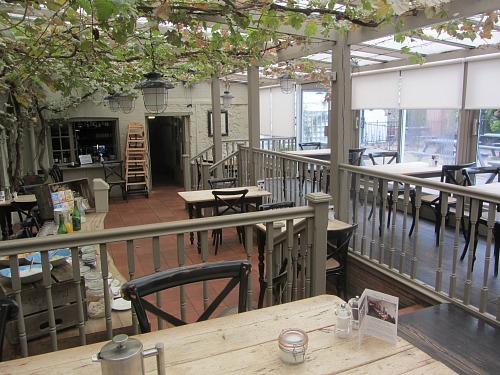 The conservatory looks out onto the terrace which has numerous tables and 2 Pavilions. 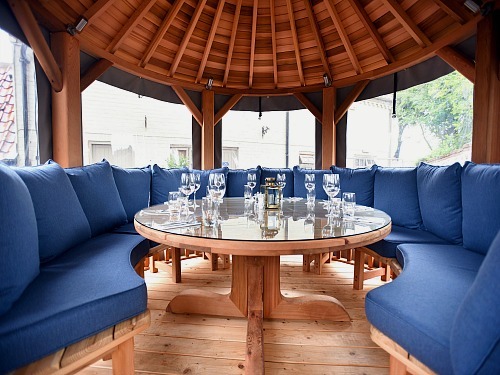 These Pavilions are a new and clever concept and are fantastic for group meals. Both The Lifeboat Inn and its’ sister pub, The Chequers Inn, have these Pavilions. You can see what they look like from the outside on The Chequers review page here. They are round pods with very comfy seating and can seat up to 14 in one pod and 10 in another pod. If the weather isn’t very nice, the sides can be put down and the heater can be turned on, making it all very cosy. It even has Bluetooth speakers if you can’t live without your music! These are excellent ways to entertain for a private lunch or dinner. One other private dining option, or if you wanted to hold a meeting, is to book the Cabinet Room which is just off to the right of the restaurant. The doors are shut and you can seat up to 16 for a meeting, or about 10 comfortably for a meal. So as you can see, there are numerous room options for eating here at The Lifeboat. 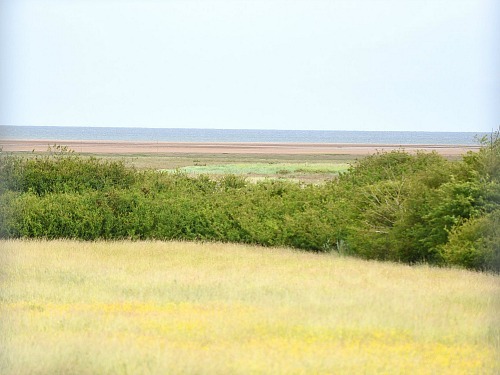 As with many of the establishments along the coast, basing yourself in Thornham is perfect for bird watching at RSPB Titchwell or NWT Holme Dunes Nature Reserve, walking stretches of the Norfolk Coast Path, and enjoying the many beaches from Old Hunstanton to Wells-next-the-Sea. The Lifeboat Inn has a wonderfully relaxed atmosphere where you can just unwind and enjoy this fantastic North Norfolk coastline, whether that be bird watching, relaxing on the beaches, fine dining or walking. Why not check availability or contact The Lifeboat Inn here?